...CPP to Review Judicial System, NHIS and Boost Ghana Airways ASIEHO, THE CLICHÉ introduced by the ruling New Patriotic Party (NPP) which became a familiar tune of the language of a vast majority of Ghanaians during the last general elections has been adopted by the Convention People's Party (CPP) for this year's elections. Consequently, the party used the slogan to launch its manifesto last Thursday. The presidential candidate of the CPP, Mr. Gorge Opesika Aggudey, said his party will use the slogan, “Asieho”, literally meaning down there, because of the party's position on this year's election ballot paper and as a matter of fortune for the party in upcoming elections. Although the popular slogan had been replaced by the NPP with the new “ two sure'' in view of the party's position on the ballot paper, Aggudey assured thousands of party faithful at the Arts Centre in Accra that “whether we like it or not we are there. This time we shall make the “Asieho” work for the party”. 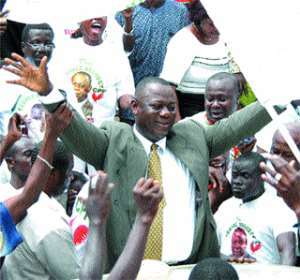 Launching the manifesto, speaker after speaker chronicled the historical achievements of Ghana's first president and the founder of the CPP, Dr Kwame Nkrumah, and said these achievements, most of which had been abandoned by successive governments, would be revived when the CPP is given the mantle in 2005. They were of the view that the country, at the moment, needs leadership that would bring economic independence rather than political independence. The manifesto, dubbed, “Working to bring the economy back home”, basically promises to transform the economy from a raw material-led base to a value added entity with a framework of responsible credit procurement, mobilisation and utilisation strategies. It also, among other things, promises to review the decentralisation law with a view to enhancing financial, administrative and sectoral autonomy in the various districts. Giving the highlights of the manifesto, Aggudey said a CPP government will call for the review of the judicial systems to ensure reduction in the number of custodial services, increase the use of the parole system and encourage agriculture in the prisons to decongest it. Other highlights, he said will be the restoration of Ghana Airways to its former status to make it stand on its feet to render services to Ghanaians both locally and internationally. “We will take a critical look at its management, operational activities and sources of funding'' the CPP flagbearer emphasised. He further gave the assurance that when the CPP is given the mandate, they would review the National Health Insurance Scheme (NHIS) to make it responsive to meet the expectations of the masses, especially the disadvantaged. The CPP presidential candidate therefore challenge the ruling NPP to come out with pragmatic measures to curb the brain drain of health professionals in the country by provision of adequate incentives to them. On his part, Dr Papa Kwesi Ndoum asked party supporters to translate their numbers into votes by massively voting for the CPP and urged them to allow peace to prevail all the time. The occasion was also used to introduce officially Mr. Bright Kwame Ameyaw, running mate for Aggudey.